AMAZING GOOP MARINE is the only adhesive needed for outdoor marine use because it repairs, seals and sticks to a wide variety of materials with superior strength to any other brand. 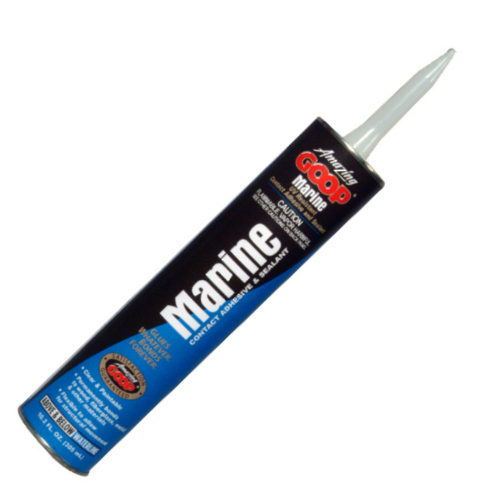 Weatherproof and UV resistant, AMAZING GOOP MARINE can be used as an adhesive and as a sealant. It’s ideal for stopping leaks in waders, wet suits, diving masks, rafts, and air mattresses. AMAZING GOOP MARINE will not crack or break under stress. Glass, plastic, metal, leather, vinyl, rubber, brick, wood and more - AMAZING GOOP MARINE is the most versatile and effective adhesive available. For additional UV resistance, AMAZING GOOP MARINE can be painted over when fully cured. Cures to an Amber color.